The relationship between the U.S. and Mexico is being tested, and the tension increased with the addition of immigrants from other countries. 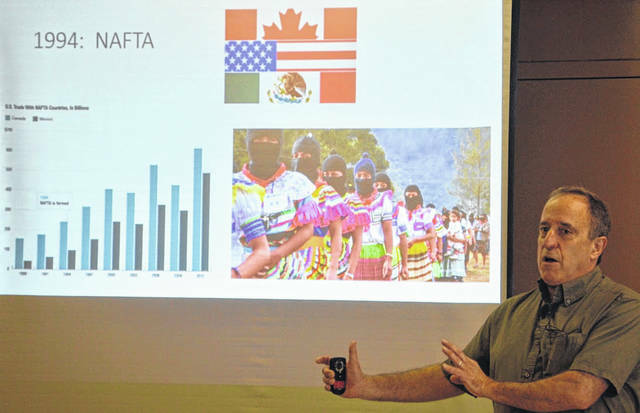 According to Jeremy Baskes, professor of history at Ohio Wesleyan University, relations with the U.S. have shaped how Mexicans see their identity. Baskes drew on his knowledge of the conflict between the U.S. and Mexico to demonstrate that the two countries go through ebbs and flows of partnership. The audience in the fellowship hall of the William Street United Methodist Church was engaged when Baskes gave his talk as the last in the 2019 Great Decisions series about foreign policy. Audible murmurs rose when Baskes raised controversial points. He said major events shaped the relationship between the U.S. and Mexico, such as the Mexican-American War, the Treaty of Guadalupe Hidalgo, and the Mexican Revolution. Relations between the two have not always been so tense, he said, with both countries benefiting and cooperating for the Bracero program in the mid-1900s, the location of U.S.-owned production centers in Mexico and the North American Free Trade Agreement. “For the most part, relations since World War II have been excellent; in many ways, Mexico is one of our closest allies,” Baskes said. This close relationship, both in location and historically, has led to an inevitable flux of immigration between the countries. Baskes used this point to explain how immigrants are pushed out of their own country and pulled into America. Baskes reminded that audience that immigration politics are a nightmare. Many politicians speak on the issue, but very little helpful and successful legislation has been introduced to stem the problem. Baskes used graphs to display the surge of immigrants over the past year after immigration had been low for the past 10 years. The new trend is that people coming to the border are asylum seekers from Mexico and Central America, rather than undocumented workers. Graphs also demonstrated the wealth disparity between the per capita incomes of the U.S and Central America. They correlated with the high levels of violence within those countries compared to not just the U.S. but levels around the world. The Trump administration has responded to the large number of asylum seekers at the Mexican border by attempting to institute a zero tolerance policy, according to Baskes. It has tried to stop asylum seekers by pursuing family separations, forcing people to wait in Mexico for their asylum trials, per diem number limits of asylum seekers, and even a possible border closure. Baskes said there are 822,000 pending asylum cases, which created a two-year wait for court dates. He said 20 percent of the requests will be granted asylum. “Most of the stuff you already knew from reading newspapers, television and so forth, that poverty and violence are the root causes of these people’s leaving, and we don’t have the will or the facilities to take care of all these people,” said audience member Don Sommers. In a quick review of drug issues between the two countries, Baskes said programs introduced by the U.S. have not stemmed the problem, just increased prison populations. They have caused the death and disappearance of many people in Mexico without stopping the cartels. Claire Yetzer is a sophomore communication major at Ohio Wesleyan University.